If you asked me what my favorite food is, I would always, without hesitation, say sushi. A particular type of sushi? Yes, sushi with raw salmon is my absolute favorite food ever. I cannot get enough of it, but I don’t have it very often. It’s one of those special treats that I buy on occasion. I don’t make it at home because I’m not comfortable with working with/preparing fish. But salmon sushi is the type of food I dream about. Since I don’t use raw fish at home, I have resorted to making other types of sushi. I’ve made teriyaki beef sushi, (cooked) tuna sushi, but mostly I make vegetable sushi because everyone else in my family favors the vegetable one. To be honest, it’s not entirely made of vegetables, as I include avocado as well and we all know that avocados are fruit! I’ve posted a recipe for sushi a few years ago, but it wasn’t exactly the best post (in fact, I don’t even want to link to it!). It was my first attempt at making sushi and I didn’t even include a recipe or instructions on how to make it – I just linked to another blog where I had found a great sushi tutorial. Now, I can make this particular type of sushi without looking at a recipe and it is one of the easiest meals/snacks to prepare. You should be able to find most of these ingredients in your grocery store – perhaps try looking in the Asian/international section if you have trouble finding anything. If you have an Asian grocery store nearby, then you’re definitely all good to go. First, you’ll need sushi rice, which is a short-grained rice. Prepare this according to the directions on the package. For mine, I use 1 cup of rice and 1 1/2 cups of water. The rice will need to be rinsed in a sieve under running water until the water runs clear. I pour the rice in a medium-sized saucepan, add the 1 1/2 cups of water, and bring it to the boil, shaking occasionally to stir. Once it comes to a boil, I immediately turn the heat down to very low, put the lid on the pan and cook for 12 minutes. After 12 minutes, I take the pan off the heat and leave it to sit, still covered, for another 10 minutes. During this 22 minutes, I prepare the vegetables I will be using and any sauces. In this particular case, I julienne 1 carrot, 1 Lebanese cucumber (I do not use the mushy center though) and slice 1 avocado. If you have a mandolin slicer with a julienne attachment, as I do, this makes preparation so much quicker and easier. I also make the wasabi mayonnaise to put inside the sushi roll, which is simply a mix of wasabi and mayonnaise. I use approximately 1 teaspoon of wasabi per each 1 tablespoon of mayonnaise. 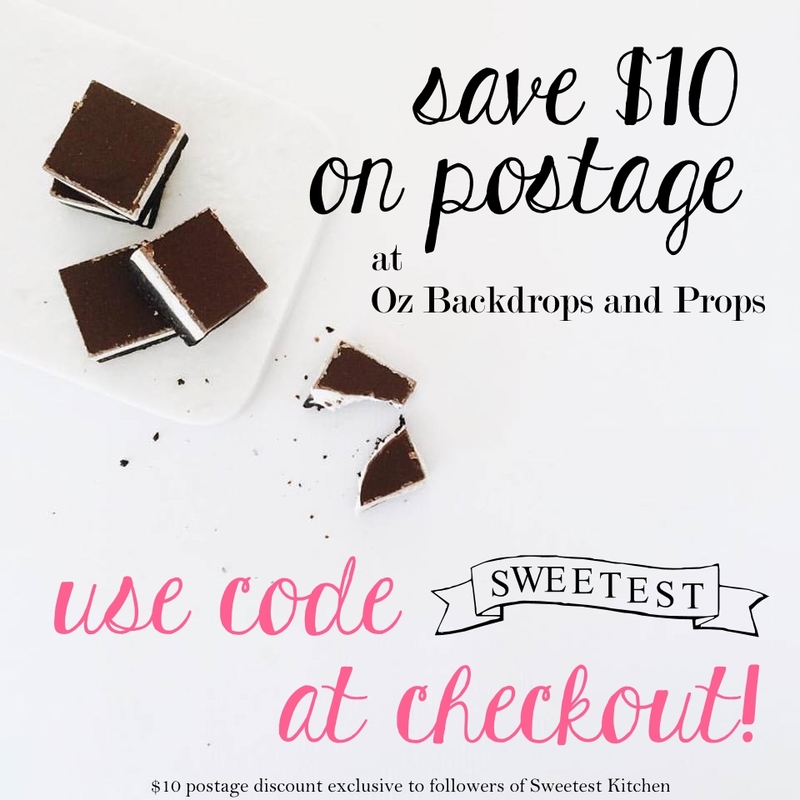 Quantities you use will depend on your tastes. I don’t think I’ve mentioned yet that I do love wasabi! It’s such an unusual sensation, but if you’re not a fan of hot or spicy food, then I recommend to skip the wasabi. You could just simply use plain mayonnaise, or don’t use any sauce at all. Okay, so after the rice sits for 10 minutes (or whatever is recommended on the package), take the lid off, and fluff the rice up with a fork. Pour the rice onto a large-ish tray (non-metallic) and spread it out into a thin layer. Pour/shake over approximately 3 tablespoons of rice wine vinegar and use a spoon to stir it through the rice. When mixed, make sure to spread the rice out into a thin layer again and fan it to cool it quickly. Use a notebook, a piece of cardboard, whatever you have lying around. Lay out a bamboo sushi mat and place a square of nori seaweed, shiny side down, on the mat. You should be able to find a bamboo sushi mat in the international section of your grocery store, an Asian grocery store, or perhaps a kitchen supplies store. I got mine at my local grocery store for under $2. Next, you’ll need to gather up some rice from the tray and spread it into a thin layer on the seaweed. I don’t have an exact quantity of rice to use, I would guess it would approximately be 1/2 cup. 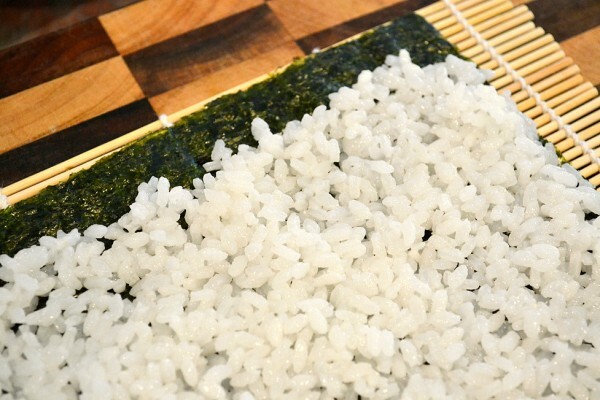 Spread the rice with the back of a spoon to 3 edges of the seaweed, but leave about a 2cm border at the edge of the seaweed furthest from you – see photo above. Oh, and be sure to have a little cup of plain water on hand. You can dip your fingers in the water if the rice sticks to your fingers. Next, spread on a thin layer of wasabi mayonnaise towards the edge of the seaweed that is nearest you. Then, place your veggies on top. I usually use 4 strips of carrot, 4 strips of cucumber and 3 slices of avocado. If you have carrots or cucumber overhanging the edges of the seaweed, use a knife to chop the excess off. And now, the tricky part. Rolling it up! Really, it isn’t that tricky though. Take the edge of the bamboo mat that is nearest you and just roll it up. I sometimes have to hold the avocado in with the tips of my fingers because it likes to slip out of the roll on occasion. Just use the mat to firmly roll up the seaweed as you go. When you get to that 2cm border on the far end of the seaweed, stop here for a moment. Dip a finger into that cup of water I told you to have on hand and use your wet finger to spread the water along that 2cm border of seaweed. It doesn’t need to be saturated. This will help to seal it when you finish rolling. When you’re done, just finish rolling the seaweed up and there you have a perfect roll of sushi! Before you cut it into slices, I recommend refrigerating it for about 30 minutes. I find that it cuts easier if it has been refrigerated. When it is time to slice, have a tall cup of water nearby, or some running water. You will need to dip a sharp, serrated knife into the water before each slice to make a clean cut. Use a gentle sawing motion to slice the roll. You can just slice it half, or slice it into 8 rounds, or however you want. With the portion of rice that I use, I can make 3 rolls. Sushi is very versatile, so try adding your favorite vegetables and meats to create a winning combination. Just be careful not to stuff the sushi to full, or roll it too tight, or the seaweed might start to split. I am, by no means, an expert on sushi. I just wanted to share this particular recipe with you and tell you what works for me! Making your own sushi isn't as difficult as you might think! 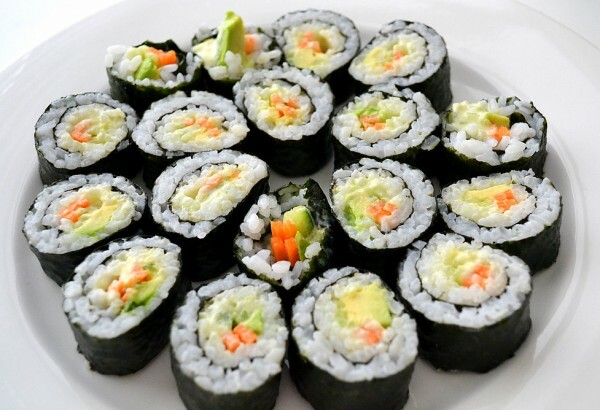 Try this recipe for vegetable sushi and you'll quickly get the hang of how to do it! Rinse the sushi rice under running water until the water runs clear. Prepare the rice according to package instructions. 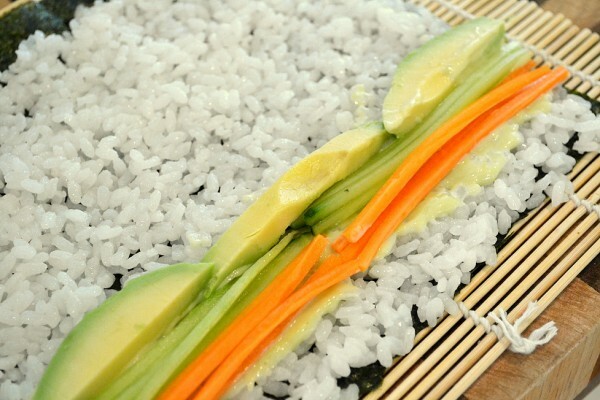 While rice is cooking, cut carrot and cucumber into julienne slices (slice around the mushy center of the cucumber, as you don’t want to use this part in the sushi) – this is easiest with a mandolin and julienne attachment – and cut the avocado into slices. To make the wasabi mayonnaise, mix the mayonnaise and wasabi together, using more or less of both ingredients to suit your tastes. You may even choose to leave the wasabi out, or leave the mayonnaise out, or just simply not use either one. When rice is ready, fluff it up with a fork, and spread it out onto a non-metallic tray into a thin layer. Sprinkle over the rice wine vinegar and stir the rice around to mix it thoroughly. Spread it out into a thin layer again and cool quickly by fanning it with a notebook, a piece of heavy cardboard, or whatever you have lying around. 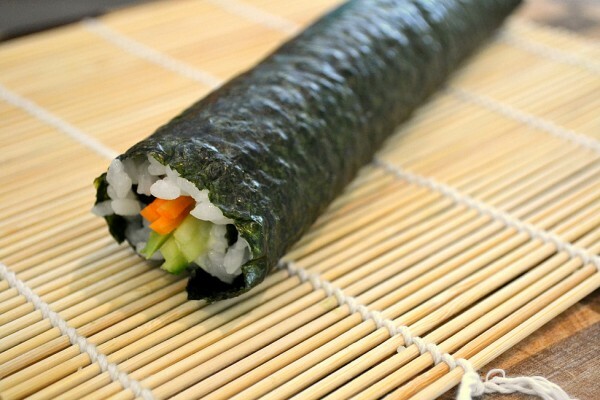 Place a square of seaweed onto a bamboo sushi mat. Take about ½ cup of the rice and place it onto the seaweed. Use the back of a spoon to spread it into a thin layer on the seaweed. Leave a 2cm border on the edge of the seaweed that is furthest from you. Spread about 1 tablespoon of wasabi mayonnaise towards the horizontal edge of the rice that is closest to you. Place about 4 lengths of carrot and cucumber and about 3 slices of avocado on top of the wasabi mayonnaise. Using the bamboo mat, start to roll the sushi up from the edge that is closest to you. Stop rolling just before you get to the 2cm border at the other edge. Dip a finger into the cup of water and spread some water along the seaweed. Finish rolling the sushi. Repeat for remaining seaweed, rice and vegetables. Refrigerate the rolls for about 30 minutes. Dip a sharp, serrated knife into a tall cup of water, or stick it under some running water, then slice the rolls however you like. Always be sure to dip the knife in the water before each cut as this will help to slice it easier. 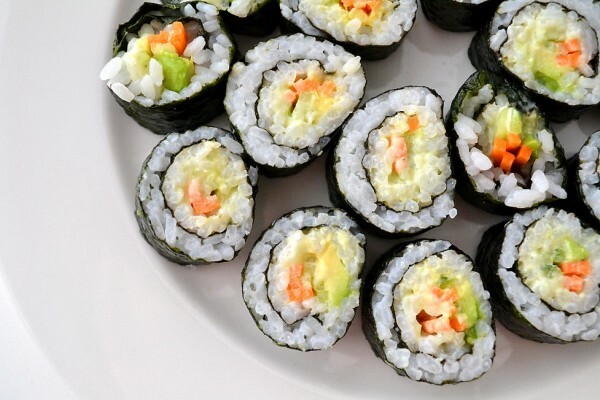 Serve the sushi with soy sauce and store leftovers in the refrigerator promptly. Refer to blog post for more detailed information and pictures on the process of making this recipe. I adore sushi, too. And raw salmon is also my favourite every filling. These look fantastic though. I think my kids would love making these – now that the weather is getting warmer we’ll have to break out the rolling mat and give them a go! I love sushi too! I wouldn’t dare to make it myself, but yours looks really professional.